Top 3 Ways To Train - Bodybuilding & Exercise Science Combined! You want the best training regime, but which is better: bro science or exercise science? Find out why you should combine both training ideas to create the perfect workout regime throughout the year! Muscle confusion programs are great, but can&apos;t always be high intensity/high reps. There is no major research to support the theory that fascia stretching helps muscles grow. Using multiple systems could maximize your strength coming into a hypertrophy program. The term "Bro Science" can be defined as common misconceptions and false information as it relates to bodybuilding. This brand of knowledge can even encompass nutrition in regards to getting lean or gaining muscle (or "bulking" as it&apos;s called in Bro Science). The vast majority of male gym rats are there for one of two things: strength gain or muscle gain. Yet as far as Exercise Physiology is concerned, the vast majority of recreational lifters are participating in what can be referred to as a modified strength program. They are not part of the proper lifting program for strength, nor are they part of the proper program for muscle gain. The big question is: Which program is best? There are so many of them out there to date which have a large fan base and bodybuilder following. There are workouts that employ muscle confusion, training techniques that focus on intensity and lifting the heaviest weight possible, and programs that incorporate "pump" sets to maximize blood pressure in the muscle tissue of a specific area. The answer: a mixture of all of them. The most traditional form of programming in Exercise Science is called Periodization1. Whether it be sports or bodybuilding periodizing your program means that you are going through different phases over the course of anywhere from 3 months to a year (depending on your goals, competition season, etc) and in each phase you incorporate a training technique to continue to force your body to adapt/improve. The idea is for you to peak, or be at your best come competition time (spring break, basketball game). What many people forget is that these new training techniques are founded from some of the basic principles of exercise science, mixed with personal experience and a dash of unproven opinion on what leads to muscle growth. Your Best Come Competition Time. This program has been extremely successful because it is a miniature model of what we have just discussed. Essentially as you&apos;re going through the different cycles of exercises, constantly putting your body up against a new training stimulus and using active rest periods where one muscle group recovers as you&apos;re training another. This works great because it is an example of what you should be doing in your routines anyway. Giving your body enough time to rest between cycling different training styles is the best way to track your improvements. As you repeat a training program/training style, see if you can improve upon your numbers from the last time you attempted it. This thought process is the best way for a recreational lifter to get started on the fast track to making improvements. Think about it? Instead of shunning other training techniques and avoiding reading new articles/research because you believe in one program; this style of lifting will keep you open to everything, and going through different phases with different styles of training keeps things new and exciting for you in the gym. The instance in which muscle confusion programs usually fall short is that they are always high intensity/high repetition programs. While this may be good for weight loss (which is what they are always promoted for), the lack of time under tension (associated with the actual time period when the muscle is contraction, not with repetitions) and multi-joint exercises (ex: squats, deadlifts, bent over rows, bench press etc) prevents it from being ideal for strength or muscle gains. But, as I previously stated, the model itself that it&apos;s centered around is ideal for recreational lifters. If You Can Improve From The Last Time. The next popular training style incorporates lifting maximal amounts of weight with the goal of reaching a pre-determined number of repetitions while incorporating an extremely brief rest period. It works to reduce the volume (sets x reps x weight) of training on a given muscle while exponentially increasing the intensity. The ideology is similar to the training philosophy of Dorian Yates as he believes that if the training intensity is high enough, you don&apos;t need to beat away at your chest for two hours at a time to get it to grow. Most training programs that are centered around a style like this do incorporate periodization by allowing for periods of minimized intensity to allow recovery. This is essentially the "Rest-Pause" technique that has been apart of exercise science for the longest time. This is where you lift a weight until failure, pause for 15 seconds then continue the set until failure. This will not only maximize anabolic hormones2 (testosterone and growth hormone are released in response to high intensity exercise) due to intensity but it will also maximize muscle damage (which does not directly correlate to delayed onset muscle soreness)3. This training style is great when it comes to covering all the different theories of hypertrophy (time under tension, anabolic hormones, high intensity exercise). However, the lack of training volume and compound training prevents it from being effective for anything else (muscular endurance, strength). The controversial aspect of this and the next popular training system is the theory that the stretching of muscle fascia (that surrounds the muscle) will lead to muscle growth. There is currently no major research to support this theory of hypertrophy. The last popular training system I have to present to you is one that incorporates multiple sets at the end of the workout to maximize the pump. The setup of the workout is fundamental: start with multi-joint movements then finish with isolation exercises. The final sets in the exercise are done with short (usually around 30 seconds) rest periods in an attempt to excite an extreme pump and to increase exercise intensity. This training style is almost identical to what is traditionally taught in exercise science in regards to bodybuilding. Rest periods of around 30 seconds using 8-12 repetitions for isolation exercises have been part of the fundamentals of bodybuilding for years; from the NSCA recommendations to personal training textbooks. A key aspect of this training program is that the pump sets effect hypertrophy independent of anabolic hormones or time under tension. Muscle fascia stretching induced by the pump is also important according to this training program. Do You Make Sure To Stretch Your Muscle Fascia After Working Out? As far as muscle fascia stretching is concerned, there is currently no major research to support it, although it makes sense that the sheath that encompasses the muscle may restrict its growth. As of the present, the leaders in limiting/regulating muscle growth according to research are IGF-1, myostatin and genetic predispositions. A training protocol like this using multiple systems could maximize your strength coming into a hypertrophy program. Stuck in a plateau? Looking for a way to increase intensity? Blast your muscles into oblivion with these four powerful & proven HIIT techniques. Try them now and watch your muscles grow while burning the fat! What Is The Best HST Workout? What is the best HST workout? This week&apos;s forum members give us an in-depth look into what this idea really is. Get comprehensive information and some great training routines right here. Become A Complete Athlete With Mind-Numbing Strength Routine! In the old days, a bodybuilder was also a strongman, an Olympic-style weightlifter and a gymnast. In the old days, a bodybuilder was a complete strength athlete. 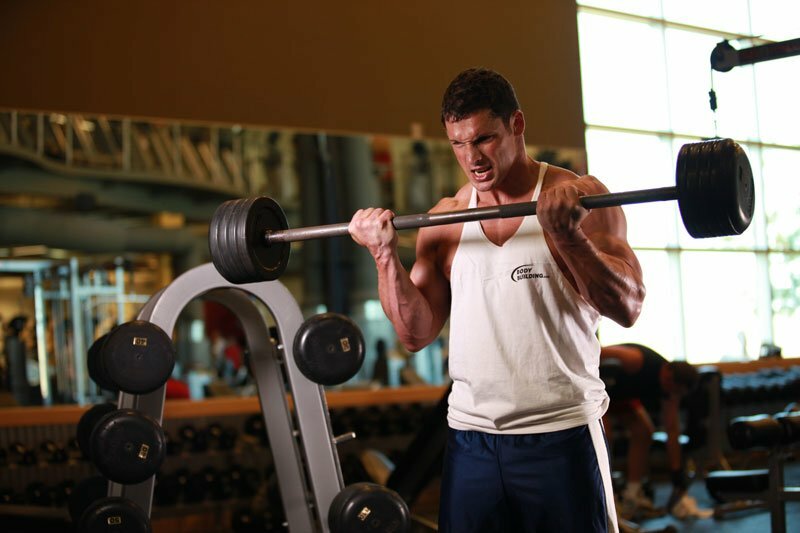 Here&apos;s a great training routine to build more strength. B. J. Nicklas, A. J. Ryan, M. M. Treuth, S. M. Harman, M. R. Blackman, B. F. Hurley, M. A. Rogers. Testosterone, Growth Hormone and IGF-I Responses to Acute and Chronic Resistive Exercise in Men Aged 55-70 Years. Int J Sports Med 1995; 16(7): 445-450 DOI: 10.1055/s-2007-973035. After spending a lot of time with the team strength and conditioning coach Dustin fell in love with exercise physiology. Here's more for fitness!